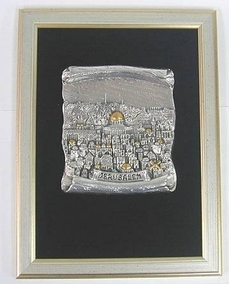 Scroll Jerusalem Plaque An excellent parcel gilt sterling silver framed relief of Jerusalem. 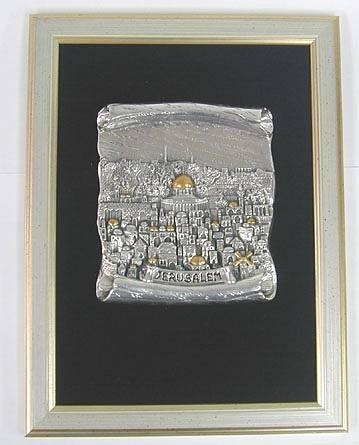 This scroll shaped relief depicts the view of the Holy City - Jerusalem in a detailed skilled silver craftsmanship. 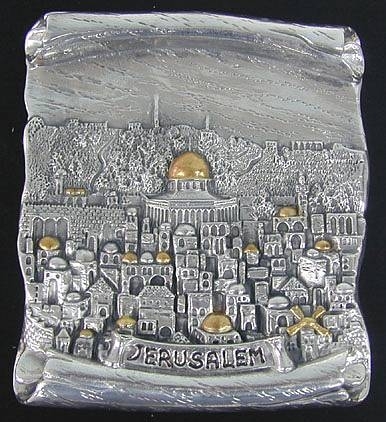 You can easily recognize Jerusalem´s famous sites as the tops of some of the structures are gold plated with 24K gold. On the bottom of the relief on a small scroll the word Jerusalem is inscribed. The relief is framed and has a black velvet background giving it an impressive look. It was made in the electroforming method. Measurements: Length: 12.7in. / 32.25cm Width: 9.5in . / 24.13cm Weight: 528gr. / 16.97oz. Marks: 925 for sterling silver.